It's generally accepted that modern humans have been on planet earth for about 200,000 years. It's also accepted that The Agricultural or Agrarian Age began 10,000 - 12000 years ago, The Industrial Age around 300 years ago, and The Information Age about 50 years ago. For the longest time there were landowners and farm workers. Then there were industrialists and factory workers. It's clear of course who was powerful and who was powerless. Then, for a short time there were information experts and knowledge workers which meant less people feeling powerless. Today we are living in the greatest entrepreneurial and intrapreneurial revolution in history. There's entrepreneurs and intrapreneurs dreaming and achieving their BHAG's (Big Hairy Audacious Goals) everywhere. It's a game-changer for anyone feeling powerless, and for all of us in general. The most successful entrepreneurs and intrapreneurs I observe are also Insightpreneurs and Differencemakers. These folk are literally changing our world. Insightpreneurs are experts at turning information into insight, into inspiration, into ideas, into innovation, fast. Differencemakers innovate for the good of people and our planet. And Insightpreneurs and Differencemakers see technology as a key to enhancing the human experience, not as a be all and end all within itself. Think UBER, Airbnb, Netflix, none of whom by the way existed 20 years ago. I then move on in my presentations to share and explore observations others have made, and that I've made myself. One such observation is that the Insightpreneurs and Differencemakers I know are purpose-driven. 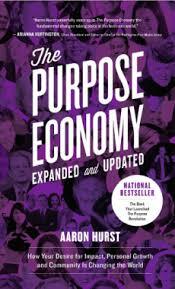 Sometimes I refer to case studies in the wonderful book The Purpose Economy or those from other great books like Firms Of Endearment, Conscious Capitalism, or Everybody Matters, and my own clients experiences. 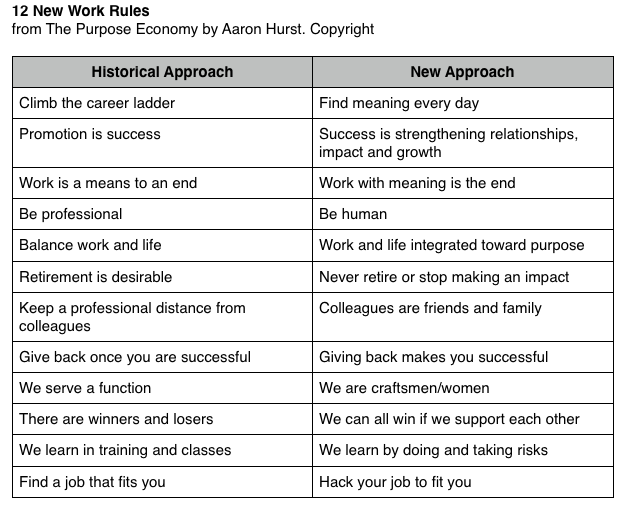 I personally don't like the use of word economy. I get it's currency. No pun intended. I don't like the use of the term 'Fourth Industrial Revolution' either. A shift I've noticed in my lifetime is the economy has moved from being part of society to society being part of the economy. I for one don't believe this shift has been a healthy or helpful one. Being purpose-driven is the key to making significant shifts in your life and work, and to doing so with speed and agility. The paradox is that your business will become more profitable. Fours years ago (a very long time in this day and age) the buzz was about a 'Connection Economy'. I think there's plenty of validity in the concept of connection too. Purpose drives connection. Agricultural Age, Industrial Age, Information Age, Purpose Age. Where are You? #1. Discuss the purpose of their role with every person you work with and help them to rewrite their job description so that it's more of a role clarity statement reflecting their purpose, and the people this purpose serves. #2. Help people discover their special personal purpose by identifying their unique gifts/talents. Ensure that enhancing and unleashing these gifts is integral to their individual performance improvement plans. #3. Begin to integrate your personal and business purpose into conversations and communication in your business. If you like some help with any of the above please do give me a shout. My number is +61 418 807 898.